Home / Mixed Bag / O Teri- Movie Preview ! O Teri- Movie Preview ! 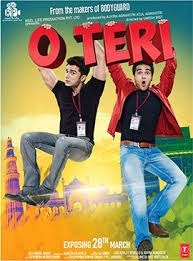 O Teri is an upcoming Hindi comedy film produced by Atul Agnihotri, featuring Pulkit Samrat, Bilal Amrohi, Sarah-Jane Dias,Sara Loren, and Mandira Bedi. The filmstars Pulkit Samrat and newcomer Bilal Amrohi as two journalists, who come across a big scam. Sara Loren and Salman Khan have a special appearance in a song. The movie is shot primarily at the iconic Mindmill Corporate Towers in Noida, NCR. The building boasts of a Neo-Classical architecture adapted from the Parthenon in Athens, Greece. The film is slated for release on 28 March 2014. Umesh Bhisht directed. The music of the movie is given by Hard Kaur and Gj Singh while the lyrics are penned by Kumaar, Abhinav Chaturvedi and Manish J. Tipu.